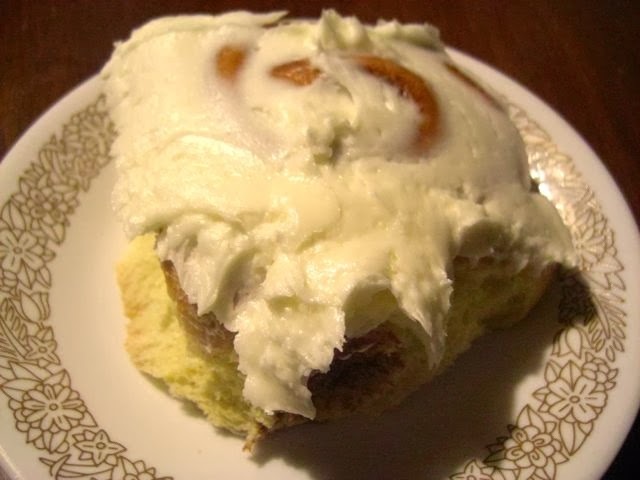 I make a pretty good cinnamon bun, but I crave store bought ones from time to time. Especially the Cream Cheese Cinnamon Buns from Foodland. The cinnamon bun part is perfectly fine, but not the main draw. It's the full tilt slathering of cream cheese icing that makes these buns a winner. It is ridiculous and amazing and makes eating more than one extremely difficult. 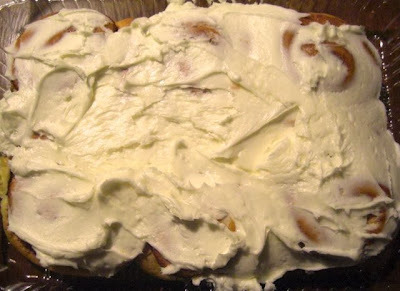 Package of six cinnamon buns - look at all that icing! You're killing me here, you know? Must stay away from Foodland. Oh good, we don't have one. Haha! OH good god. Now I know what I want for dinner. I think it would make an excellent meal! :) I definitely had these for breakfast and will do so again in life for sure. I love that you did a full photo and then a single shot. Yeah, I can see them being high in price.